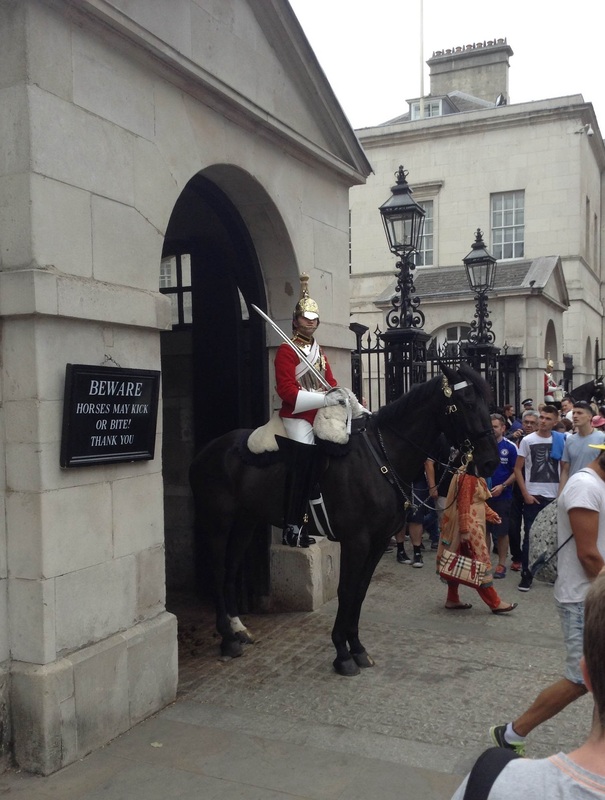 In August I had a brief holiday in England, including 2 days spent semi-randomly walking around the center of London. Of course blogs about London are a dime a dozen, so instead of boring you with too many details, I am keeping it simple with a brief blurb about the location, a photo, and (when needed) some interesting facts or a comment below each image. Shadwell; a perfect East-end London launching pad for my treks. I arrived in London from Houston Saturday morning, rushed to Shadwell, got my room, and turned right around and headed over to “The City”. 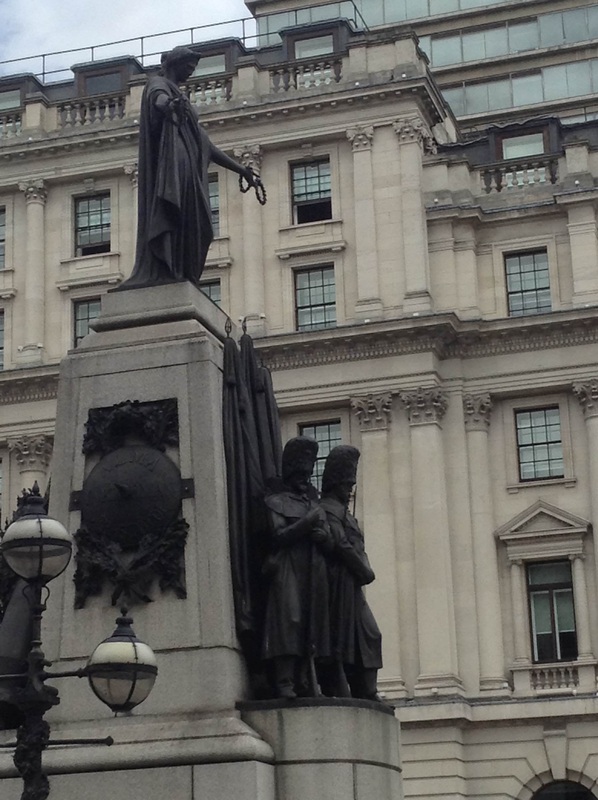 “The City” is the financial heart of London (think Wall Street), but a lot older and classier. I was lucky that my first day here was a bike festival (RideLondon 2015), so there were no cars. None. Not one. I could walk everywhere! Can you imagine a downtown office job with buildings like this right outside? On the right is the Tube sign for Bank station, just out of view on the left is the London stock market. Bank really is the perfect stop for exploring The City, Bow Bells (St Mary-Le-Bow), and St Paul’s. From The City I wandered towards Southwark bridge, with its great view, but I was quickly stopped by this. I think it is a UK tourism requirement. Everybody has to take this picture at least once per trip. And please don’t ask. 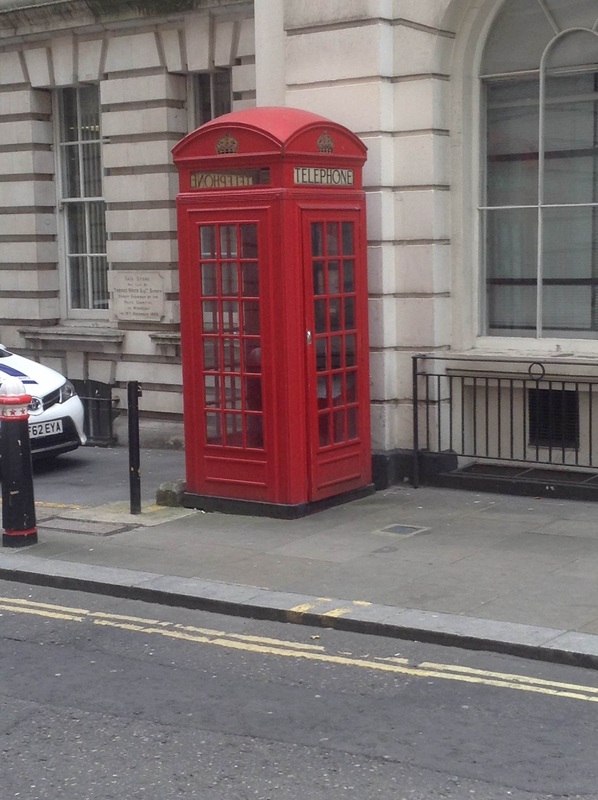 Even though this is not a Police call box or a Tardis, the answer is Tom Baker. He is the tall one with the scarf, the best Dr. Who. Crossing Southwark bridge you get some unique views of London, especially when looking down river. But most tourists don’t come here, as they are drawn to the better known bridges. 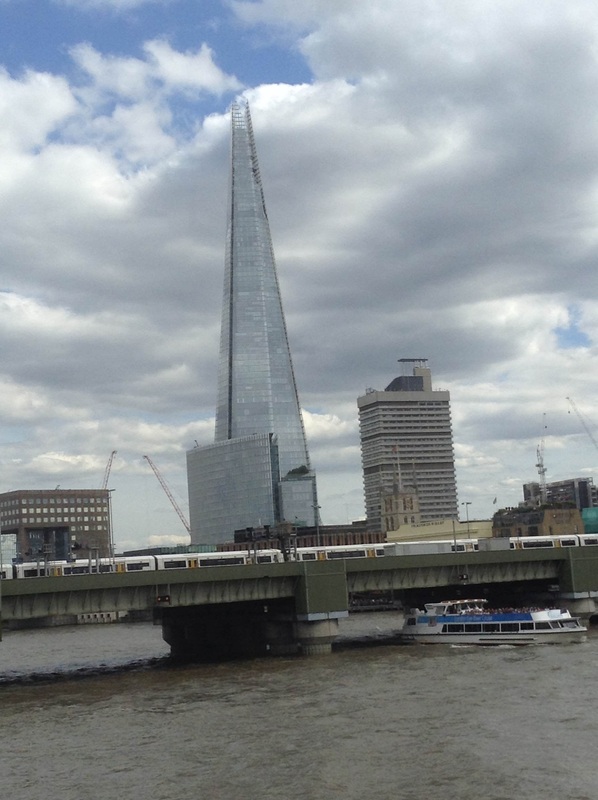 This photo features The Shard, which is located near both London City Hall (LCH) and HMS Bristol (moored in the Thames). And I will say it now. LCH might be the ugliest building in London. Sorry! But it looks like an escapee from a Salvador Dali painting of a melting building. Nope. No photos of it, but you can Google it. 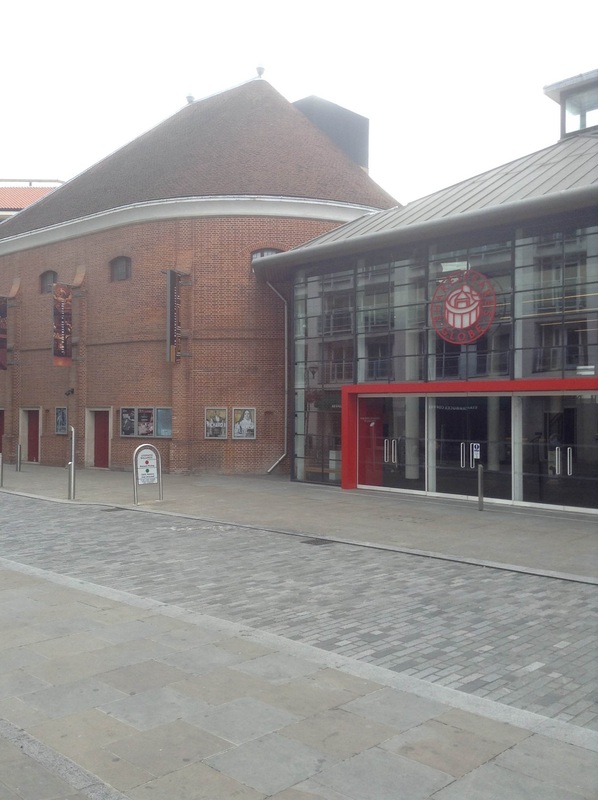 After crossing I was now 100 yards from The Globe, a rebuild of the original Globe theater, where Shakespeare’s plays were once put on. To me, it’s a candle and a moth kind of a thing, or “Thus hath the candle singed the moth”. Sure the theater is a replica, but man… History!! 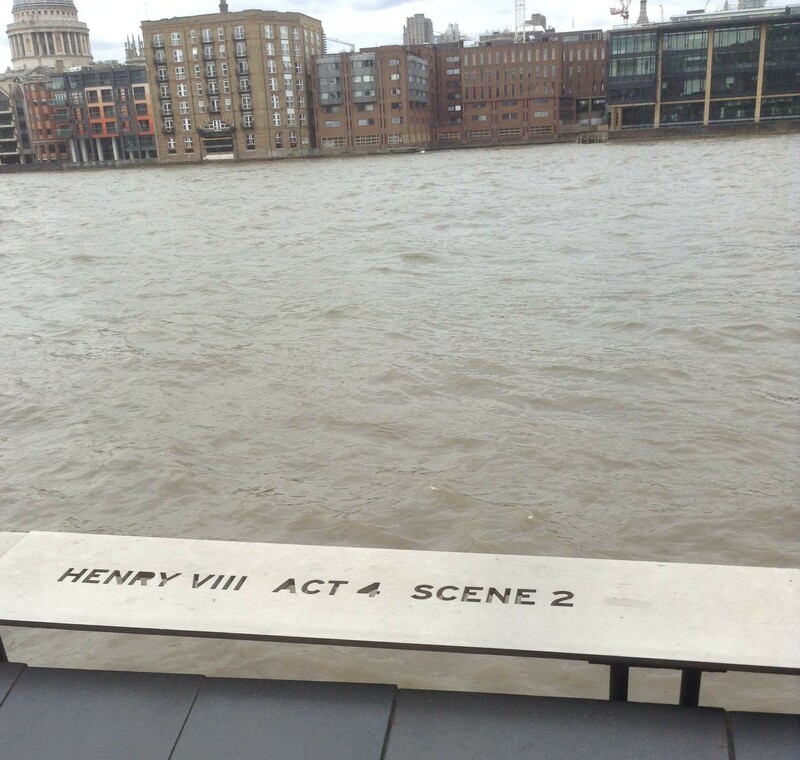 When you consider the play was about Henry-Viii, yeah… Some seriously evil manners. But he did lay the grounds for much of modern England, with the separation from the Catholic Church, and the formation of the Royal Navy. But did he have to be so nasty about it? One last thought… The City, The Globe, The Shard… What is it with these capitalized “The”s ??? 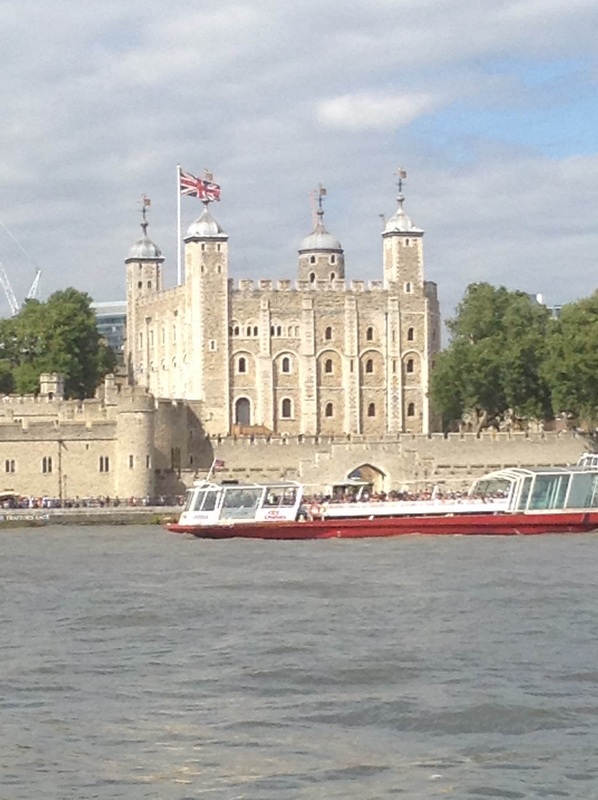 From the south bank of the Thames, The Tower of London (another “The”) and home of famous ravens. By the way, this photograph is the proof. It does not rain every day in England. I had perfect weather. 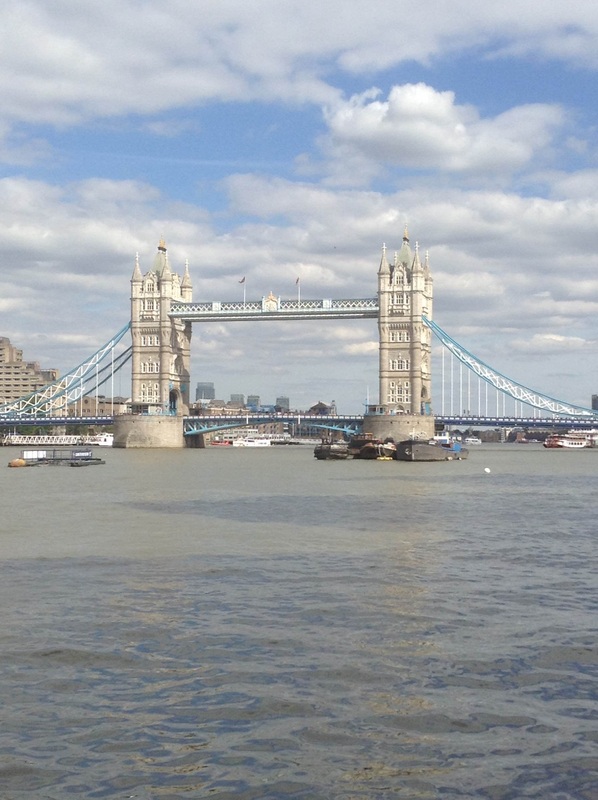 I had to re-cross the Thames to get back to Shadwell, and Tower Bridge was a great place to do that. 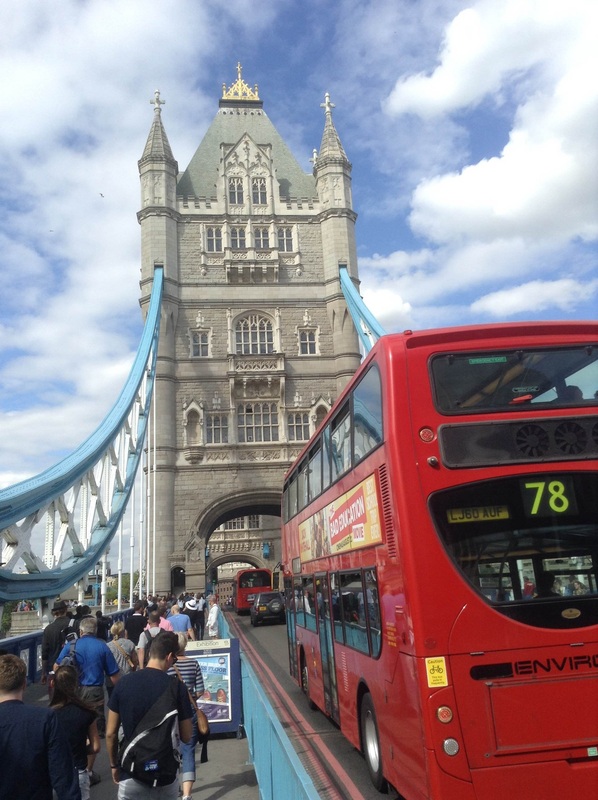 But I waited quite a while on the bridge so I could frame this picture with a classic double-decker bus in it. Yes, I really am this tall. Not hard to shoot photographs right over the heads of pedestrians. 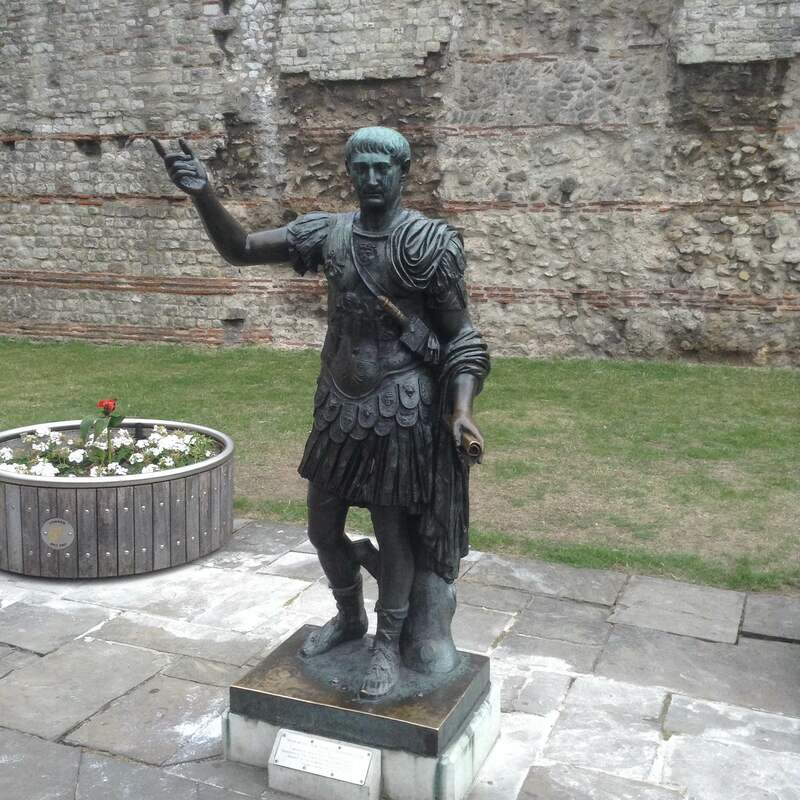 Now of course I am NOT saying that I did this, and I would not post the picture if I did (chuckle)… But a photograph of this Roman officer holding a cellphone in his right palm is a priceless travel souvenir! East of The Tower and encompassing a bend in the Thames are the quiet neighborhoods of St. Katherine’s & Wapping. I had never been through here before, and I really enjoyed walking the area. I did get a case of sticker shock (big $$) looking in the window of a local Real Estate office. 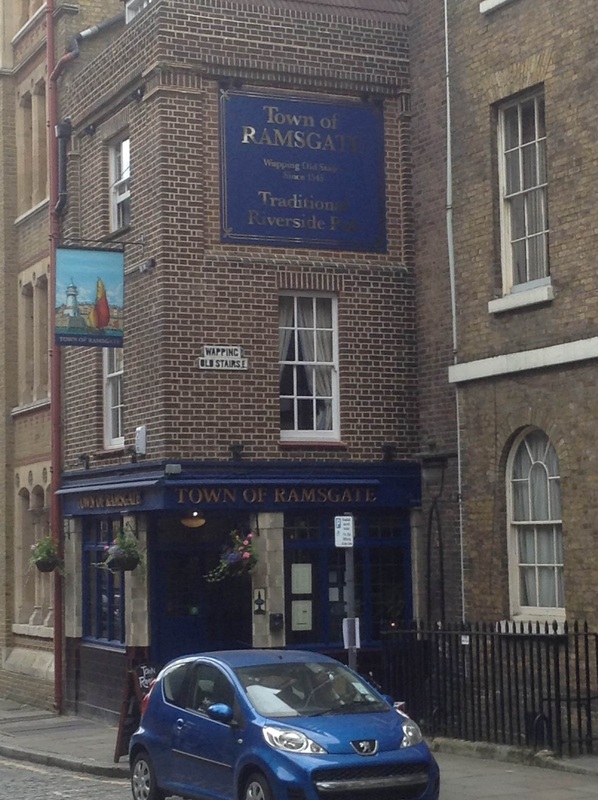 But no worries, and no $ shock, when I found the Town of Ramsgate riverside pub and a great fish & chips dinner. Honestly, no complaints. Perfect walking weather, partly to mostly sunny, comfortable temperatures, and it was just an all-around great first afternoon in London. OK, maybe I do have one complaint. Pubs!! 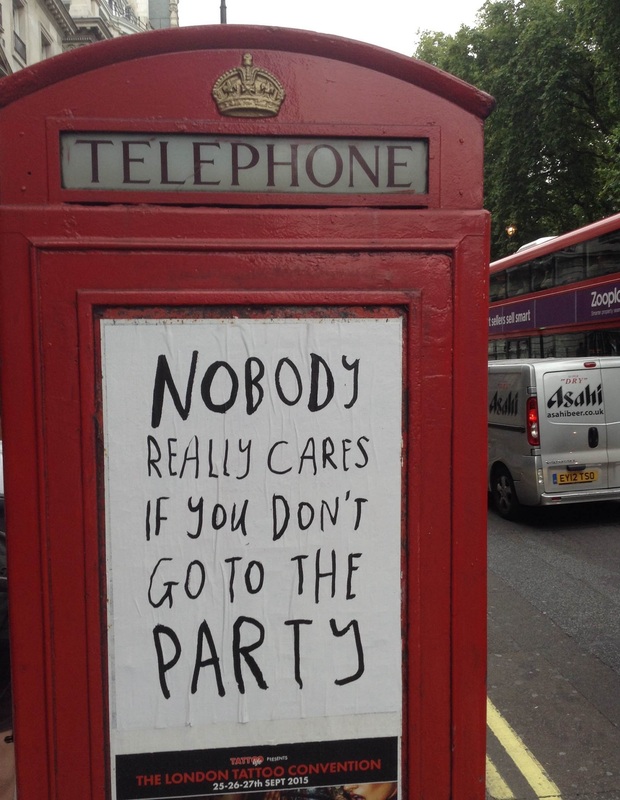 There are too many pubs in London. 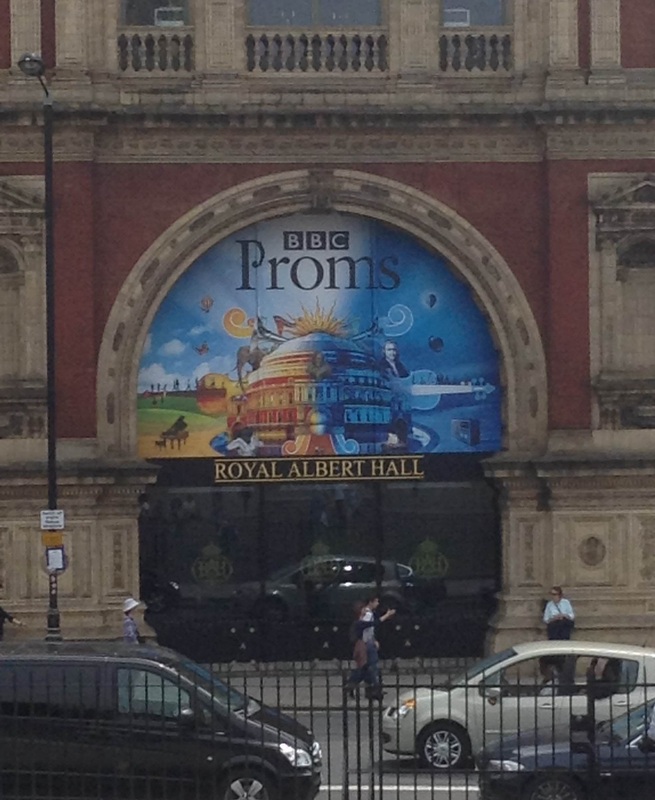 I actually had to walk past some without going in! Please note that some tube and bus rides were involved between these Day-2 segments because there is a limit to how far I can walk in one day. Day-2 started out at Paddington station, because my wife needed a new Paddington bear. And if you are going to buy one, it really should be bought at Paddington station. 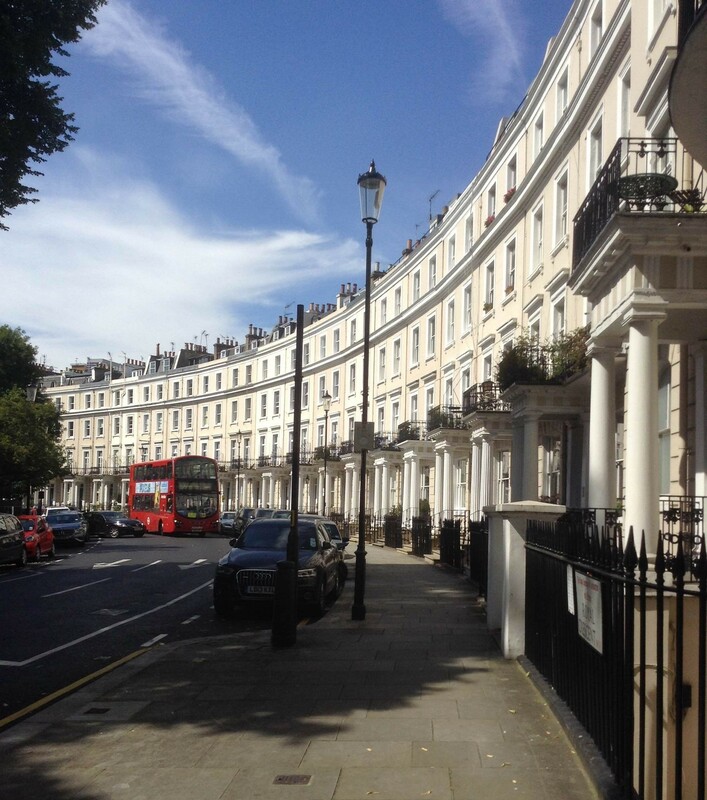 From there it was a short walk to the Lancaster gate entrance for Hyde Park / Kensington Gardens and to my old childhood friend, Peter. I remember this statue from when I first saw it in the 1970’s, and I ask you: Does Wendy look like a 1920’s/30’s Flapper girl in those clothes? Yes? I thought so too. 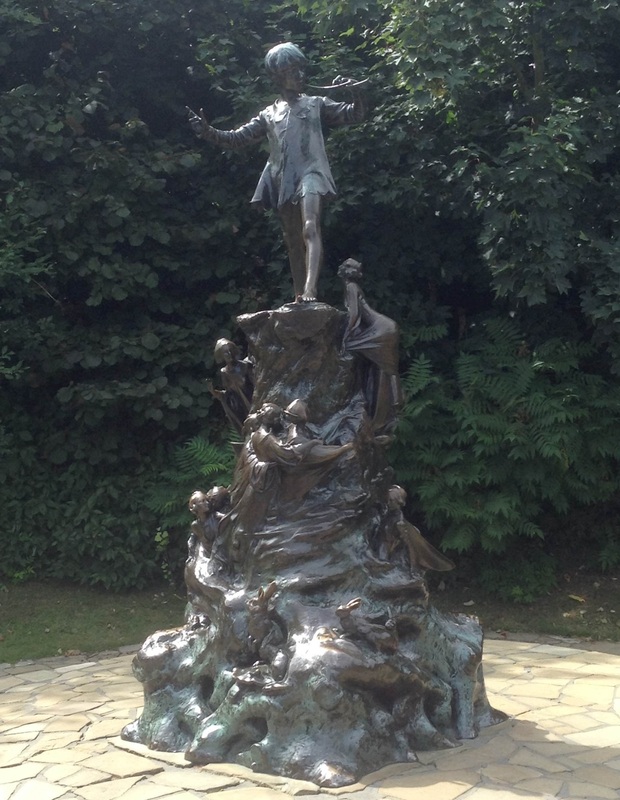 Actually, the statue is from 1910. 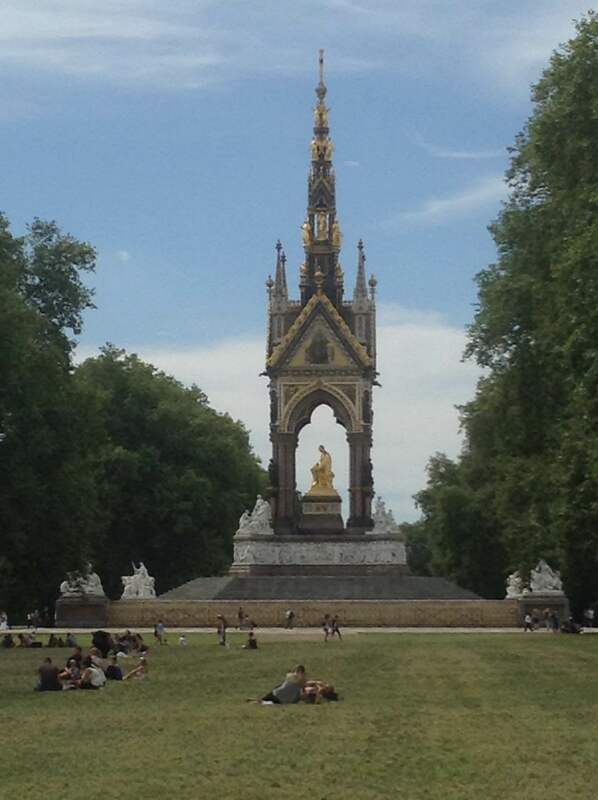 From here I wandered a bit, stopped by Princess Diana fountain (PACKED with tourists) and cut across the park to the Royal Albert memorial, erected by his widow Queen Victoria. This is impressive. Usually most shots of this memorial are taken from the front. But I like to be different; I went for a side shot. 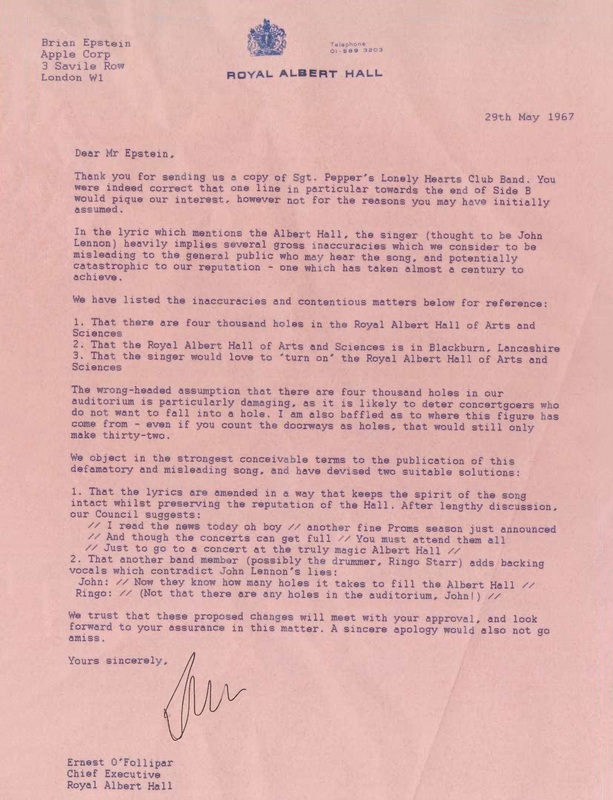 “Now they know how many holes it takes to fill the Albert Hall” By the way, the Royal Albert Hall (RAH) executives in 1967 were really upset at the Beatles for that line in the lyrics. Really upset. From the RAH I looped back up the west side of Kensington gardens, right past Kensington Palace, on an amazing wide tree lined pathway easily shared with walkers, dogs, Segways, and bike riders. Ending up out of the Park on Bayswater, I took a short bus ride west, thru the Notting Hill area to the Kensington Hilton, just so I could get this photo of the Royal Crescent. I have always loved this area. 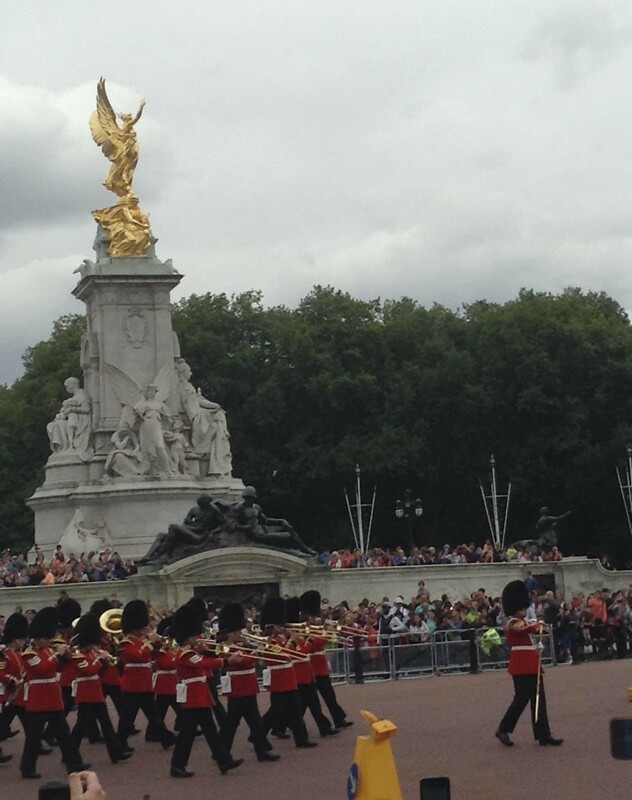 Next stop was Buckingham Palace and the 11:30 changing of the guard, which required rapid footwork and a Tube ride to Victoria station. OK, confession. I had never been to the changing of the guard. Northwest of Buckingham palace, in a space before you get to Hyde Park, right by the Hyde Park Corner tube station is an area you will want to take some time for quiet reflection. Here there is a collection of thoughtful memorials, including those who died in war from New Zealand, Australia, and fighting with WWII Bomber command. 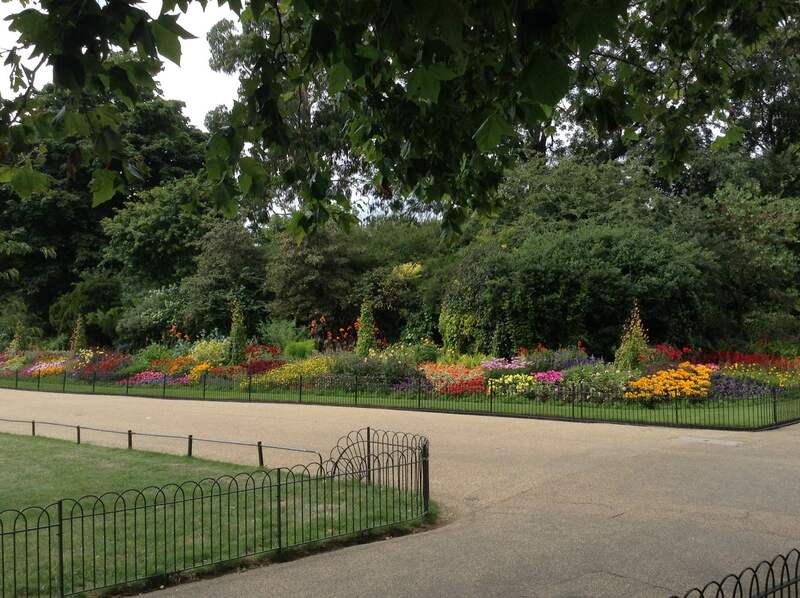 There are a lot of places like this in London, and maybe this Hyde Park area is a bit more touristy than most. But I’ll let two pictures speak for themselves. 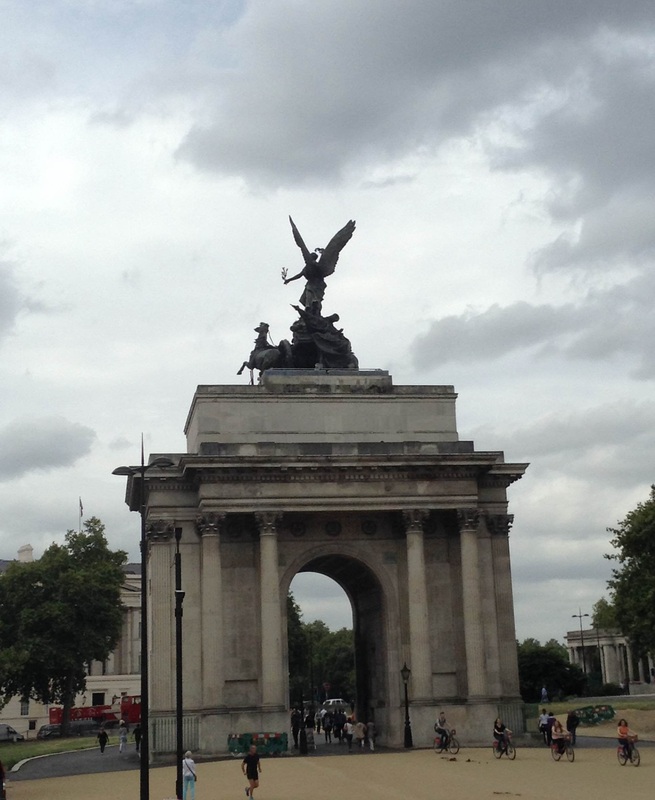 The Wellington Arch; Duke of Wellington, victor at Waterloo, and also in India, Portugal, and Spain. 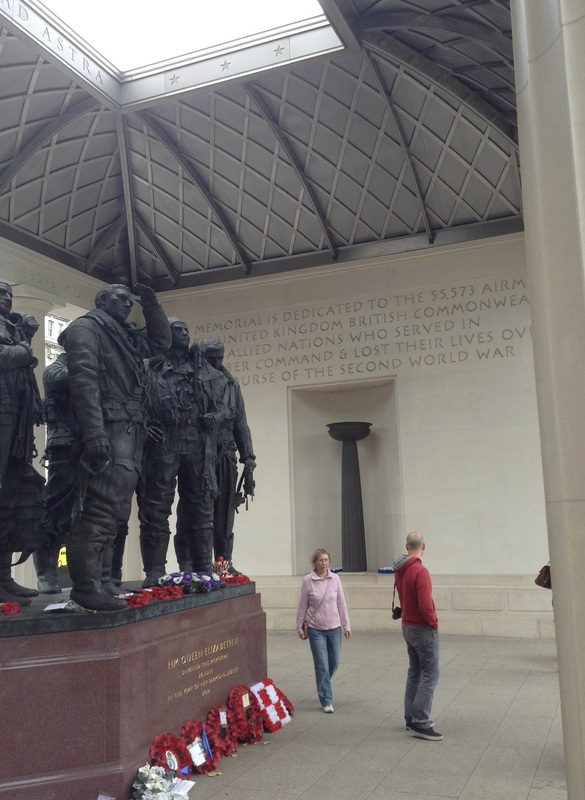 WW-II Bomber Command memorial, over 55,000 fatalities are remembered here. Today some question WWII strategy and tactics. 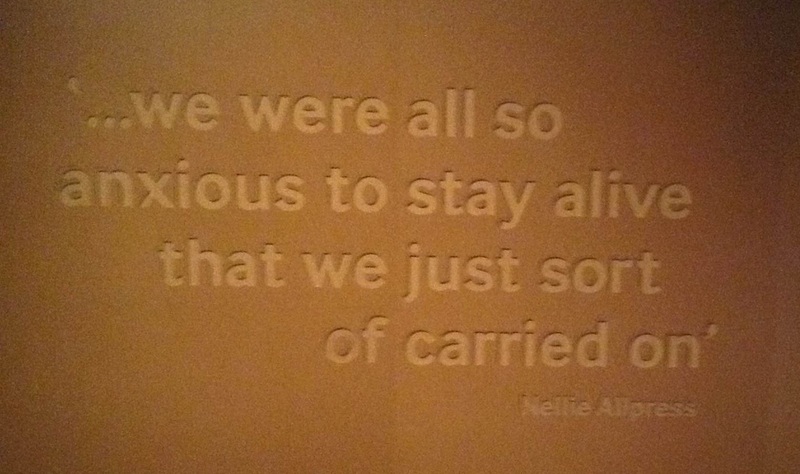 But in the 1940’s, it was a war for survival. No question. The wait for a table was 30 minutes, but there was an open seat for me at the bar – no waiting at all. Extra Bonus points if you know how many years after opening before that first guitar went up on a wall. 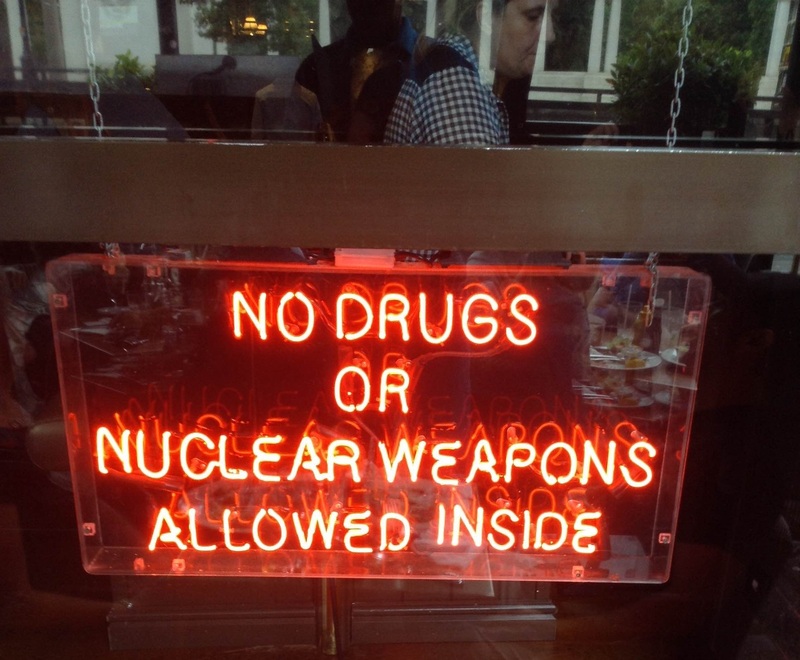 Oh bugger… It looks like I was fresh out of both… No nukes or drugs on me today, but a great pulled-pork sandwich. Piccadilly is a great walking street. High end stores, hotels, embassies, and some history too. 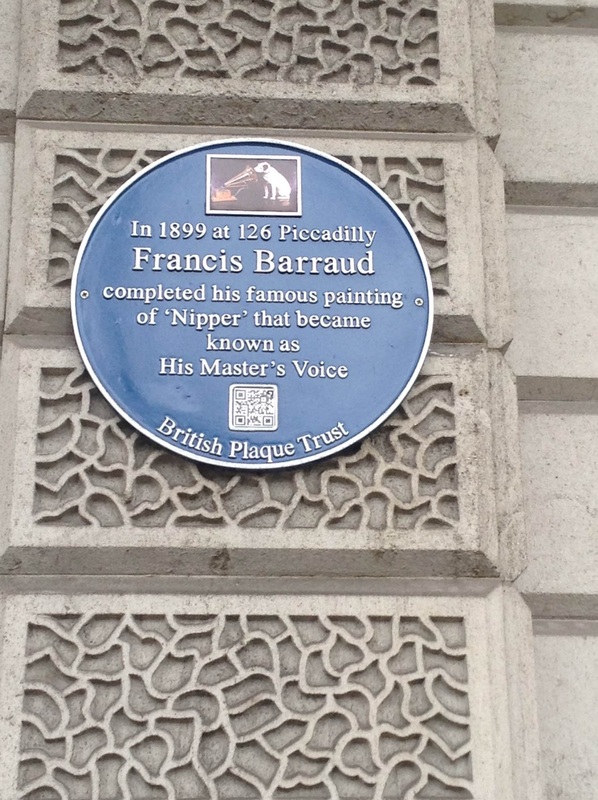 Fun fact, I worked at RCA for 3 years right out of college, and until I read this plaque, I had no idea about the origin of “Nipper” and “His Master’s voice”. I thought it was an internal RCA advertising slogan. And humor… This is on Piccadilly, just a few yards away from the Japanese embassy. An after lunch coffee in here? Sure. Why not… Café Concerto on Picadilly, the most expensive coffee of my life. Further on down Piccadilly I walked into the lobby of the $550/night Piccadilly Ritz London, but only so I can honestly say to people “Yeah, I’ve been there”. 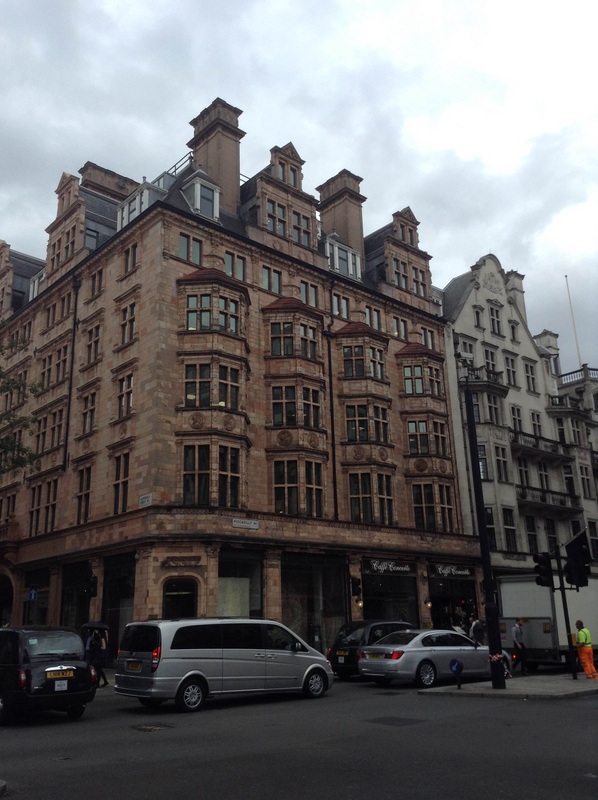 Walked past DeBeers, Fortnum & Mason also Marks & Spencer (premium department stores). Then I cut over to St James church (built by Sir Christopher Wren), leading me to this shady peaceful & restful stop on a wooden bench in St James Square. 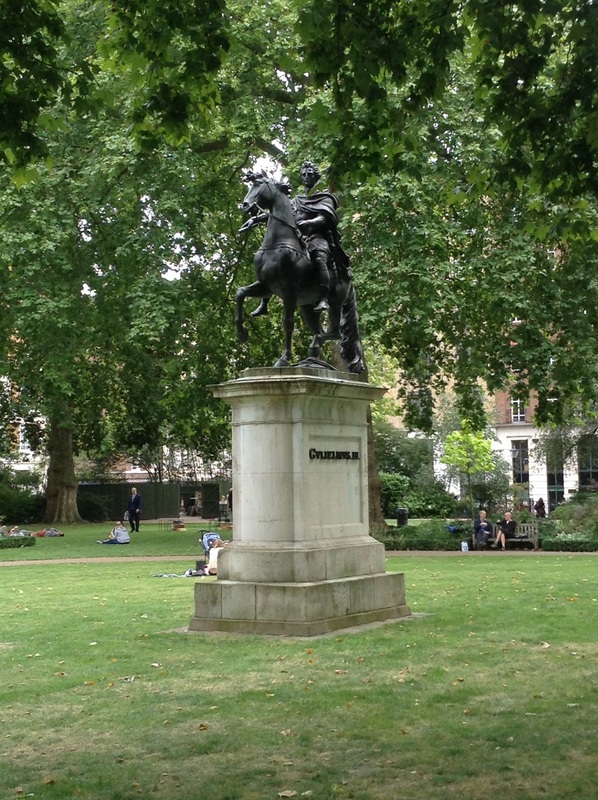 St James Square is an urban island of serenity, surrounded by incredibly posh real estate. 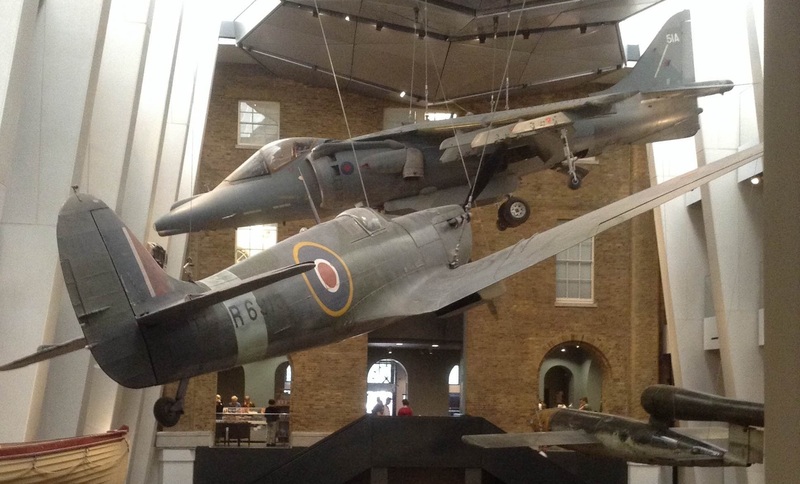 I confess to being a bit of an aviation buff, especially WW-II and the Battle of Britain. So it was a really nice surprise to also find this memorial just before the end of Waterloo Place. 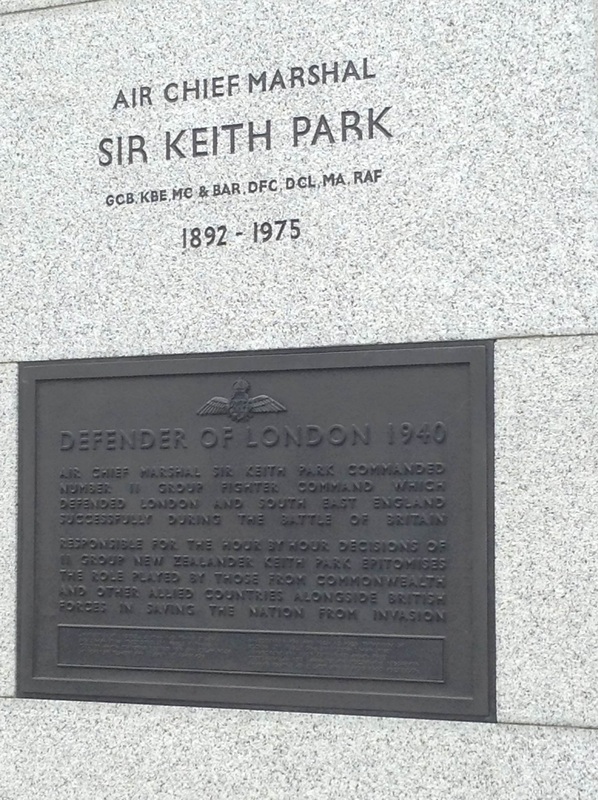 Keith Park (from NZ) was the guy who ran South-East England’s fighter defenses (Group-11), and pretty much saved London. And England. 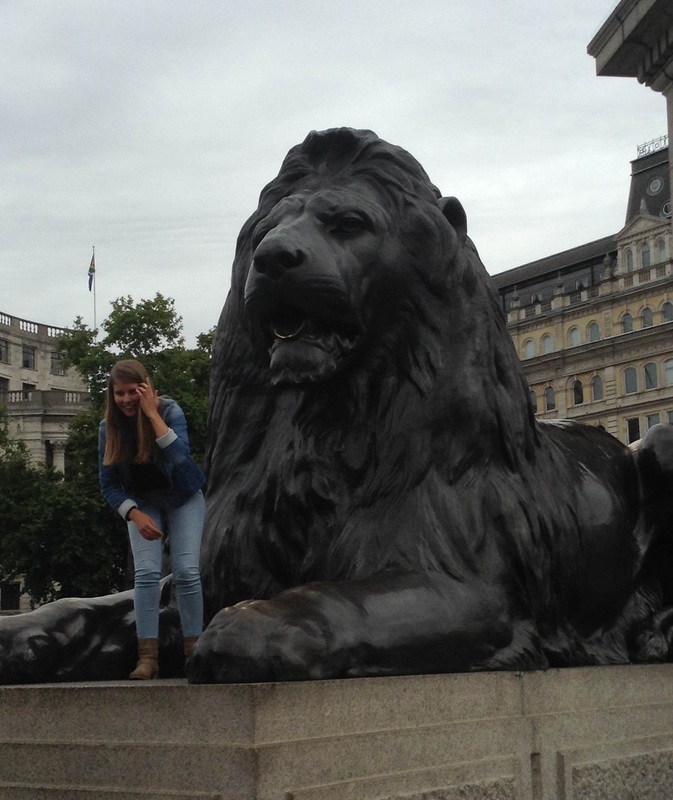 Detour time, a short trip up The Mall to Trafalgar Square, home of England’s most famous lions, Nelson on his podium, the Canadian and South African embassies, and the National Gallery. I’ll skip Lord Nelson and the obvious stuff, and jump to something much nicer to look at. No not the girl (she’s from Denmark), and yes, CUTE. But look at the Lion! There are 4, and people climb all over them. 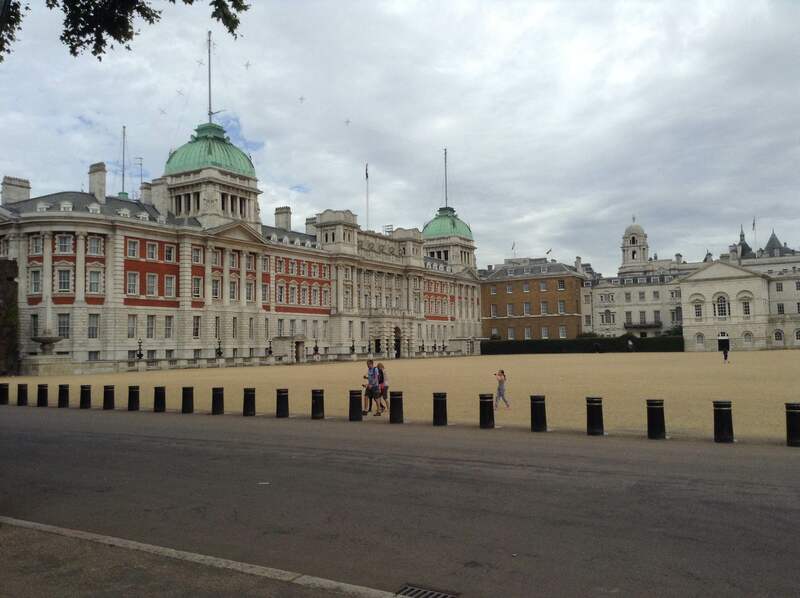 Doubled back to Horse Guards Rd, and went to the largest beach in the city of London, the site of the volleyball competition in the London Olympics, ‘properly’ known as the Horse Guard Parade grounds. And the London Guards Division memorial & flower garden (in St James Park) right across the road – which is a flower filled urban mecca! 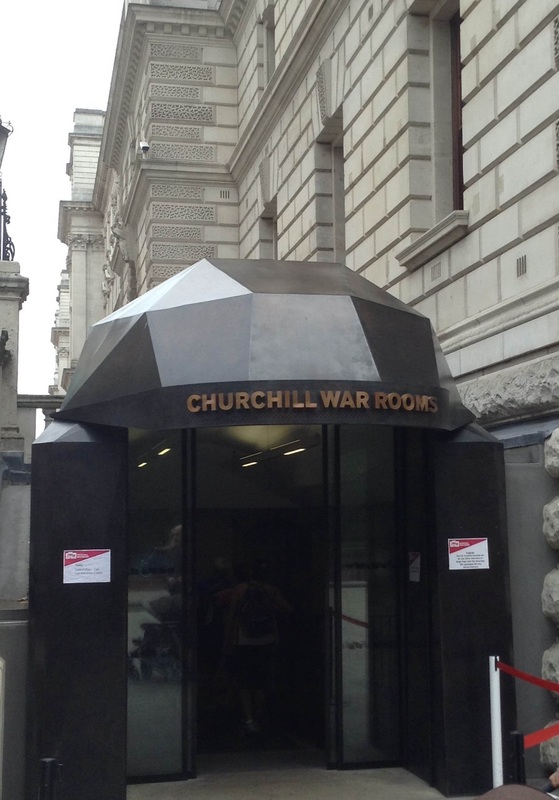 Next is Churchill’s WW-II war room, where he worked underground during the blitz. This building is also Her Majesty’s treasury, and one block away is #10 Downing St, the Prime Minister’s official residence. Fun fact: Only 1 major ambassador picked up his skirts and fled London every night in the blitz. Ours. USA’s yellow-bellied chicken Ambassador Joseph Kennedy, the father of JFK, left the city each night. And then you turn one more corner and it shows its face in full glory. 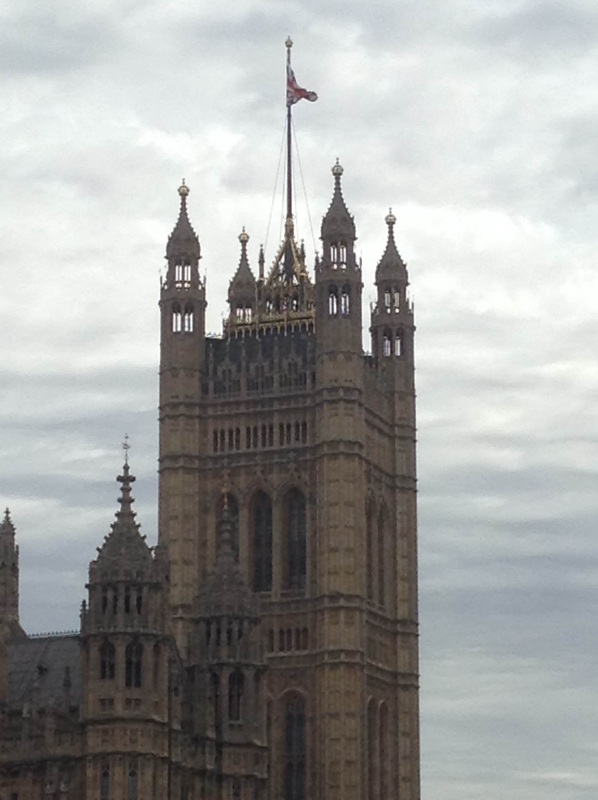 The icon of London, Big Ben. 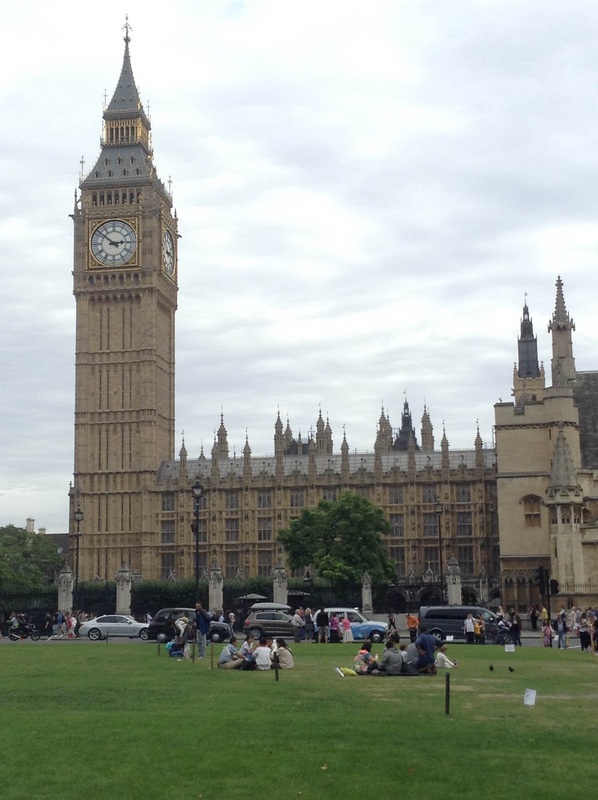 Odd fact… Big Ben is the name of the great bell itself, not the name of the tower. And Parliament. Can’t forget Parliament. You know, all the old architecture here is really impressive. 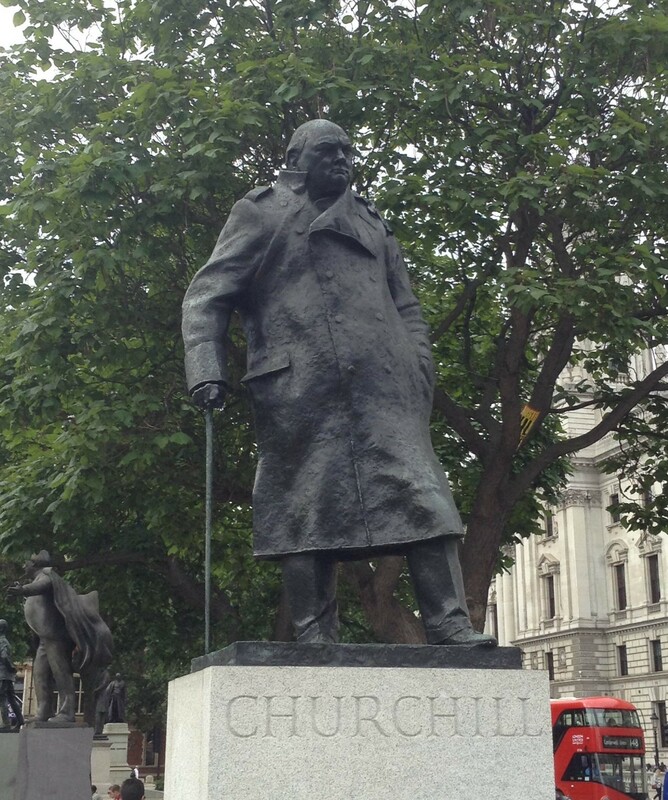 It is fitting that a statue of Churchill himself is situated here, overlooking Westminster, Parliament, and London. There have been many Prime Ministers (our equivalent of a President), and just as we have our top few, he was one of England’s best. Certainly he served her well during “their darkest hour”. And I say this with no disrespect at all… England… Bulldog… Churchill. Yup! Look at that scowl. 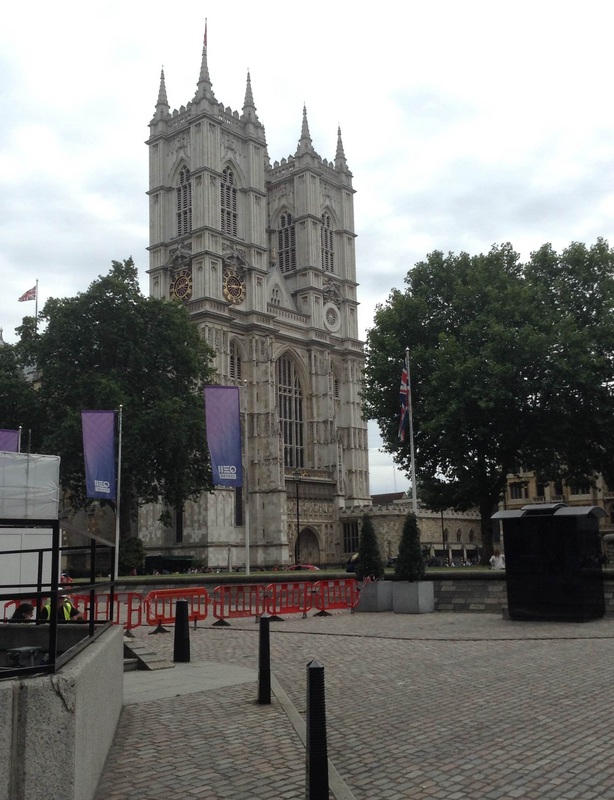 Westminster abbey (it really was an abbey) is the burial place of many historical figures, from Geoffrey Chaucer (~1500) up through Sir Laurence Olivier (1989), and has been the site of Royal weddings from the year 1100 through modern Prince William and Kate Middleton (2011). That’s nearly 1000 years. History in London is just everywhere. We have nothing remotely like it at home. And lest we forget, England certainly has not, it was not just men that fought and died in her wars. I think the symbolism of the empty cloaks and jackets hanging here is perfect. These clothes from every service and occupation (from housewife to nurse to pilot) are empty now, but the clothes will always be here. Ready to be worn again when the need arises. 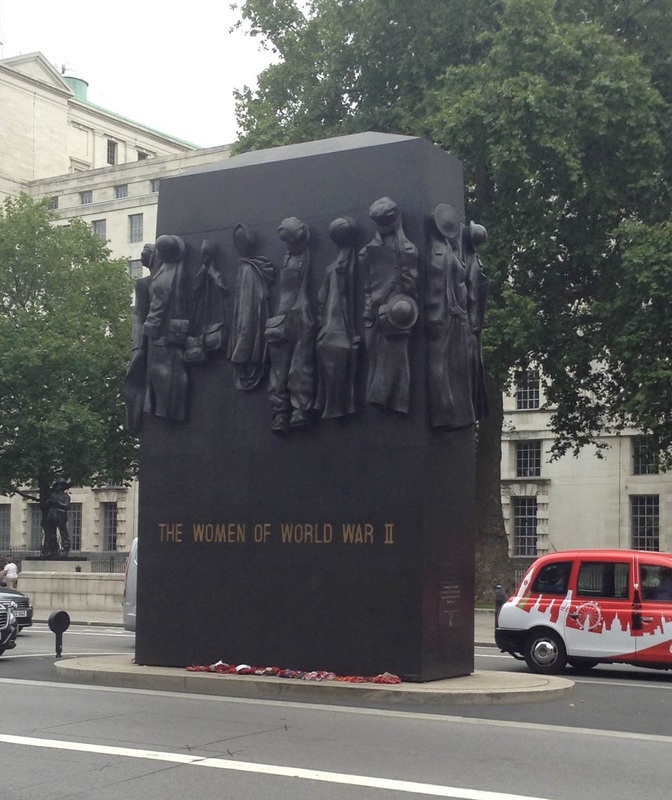 You just can’t escape history in London. 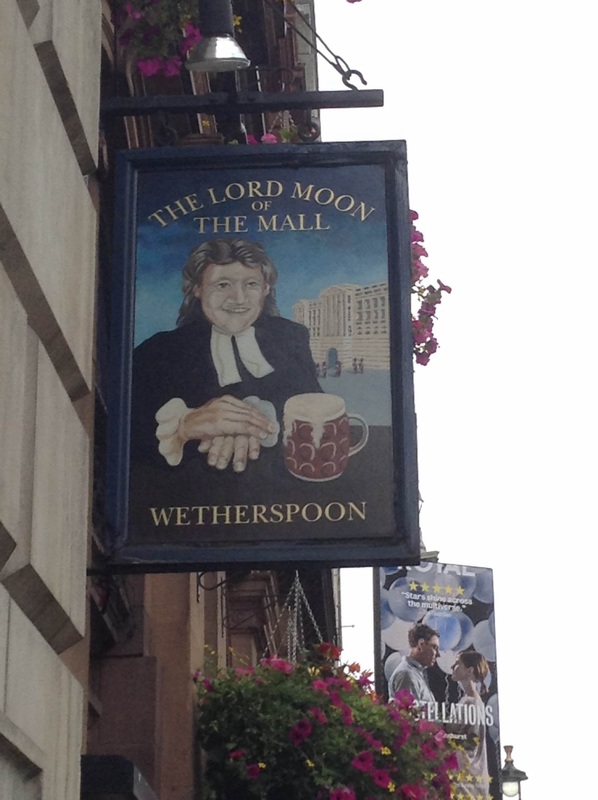 Back to the fun stuff; Another one of the really inviting pub signs I saw. So many pubs, so little time. 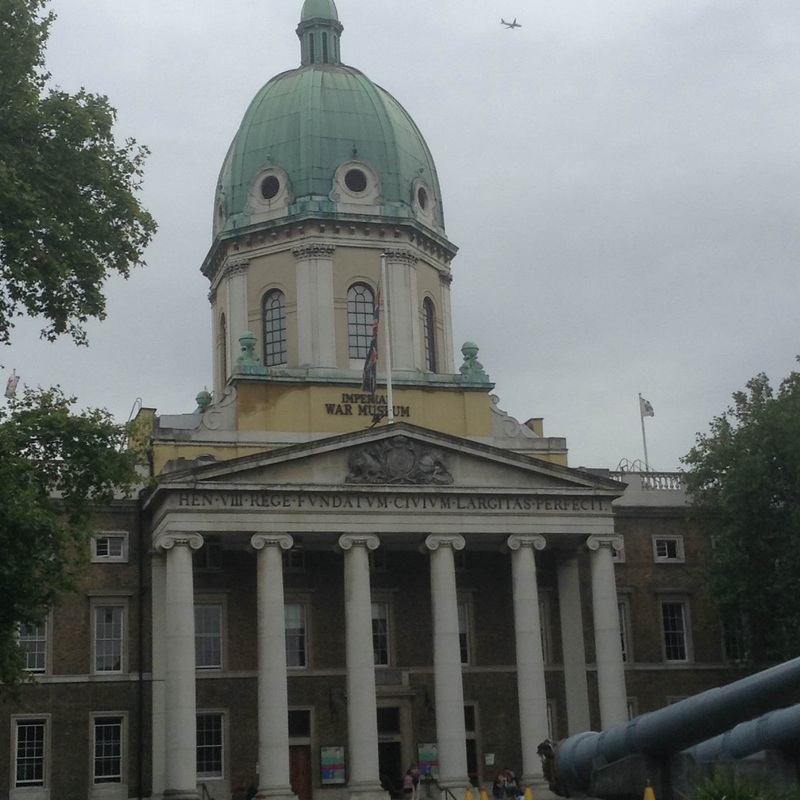 I then took a long walk, longer than I expected, all the way to the Imperial War Museum on the south side of the Thames. This was a place I had last visited around 1972, and I really wanted to go back. This IWM is actually the ‘little sister’ war museum, as the big branch is up in Duxford near Cambridge. But it is incredibly convenient to have this here in London, and they really packed the floors with artifacts. Each floor is (basically) dedicated to one conflict, and WW-II is by far the largest collection. Totally unexpected was to find some of the twisted metal from New York and 9/11 on display. But terrorism is also war, and there were British citizens who died on 9/11, and later on in Afghanistan. The IWM closes fairly early (6 PM), so I could not stay as long as I wanted. But it was late, I was tired, and on the way back to the Tube I found the “Horse and Stable”. This was a really cute little pub, located right by the Lambeth North tube station. 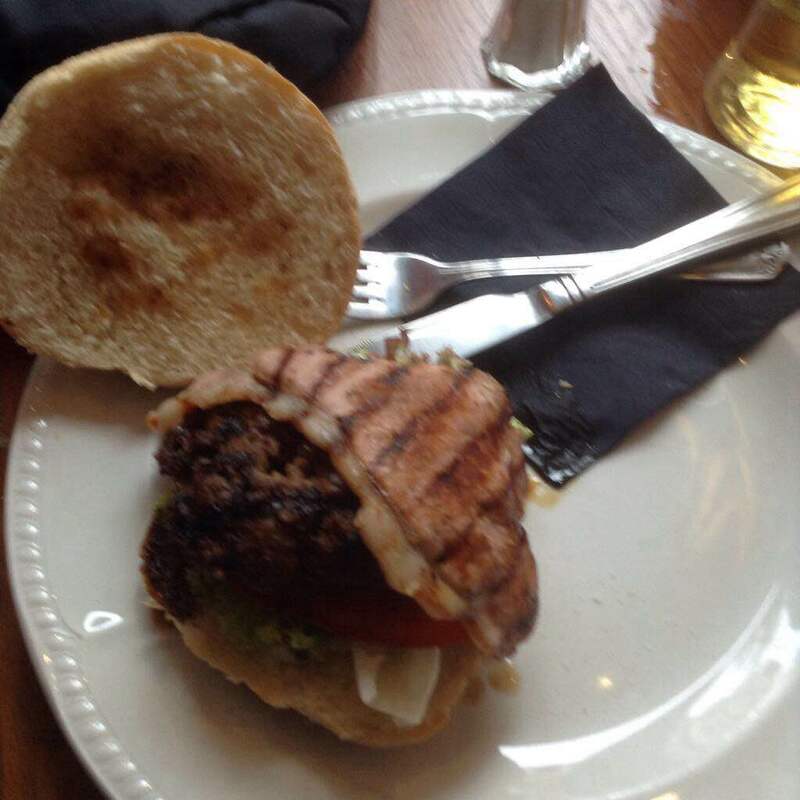 Without exaggeration, they had the best burger I have ever eaten in England (their Tennessee burger, with bourbon sauce, ham, bacon, and fixings). I also suggest (strongly) that when getting ‘chips’ (what we call fries) with a burger you ask for a bottle of Worcestershire sauce. You will never go back to using boring bland ketchup on your fries again. 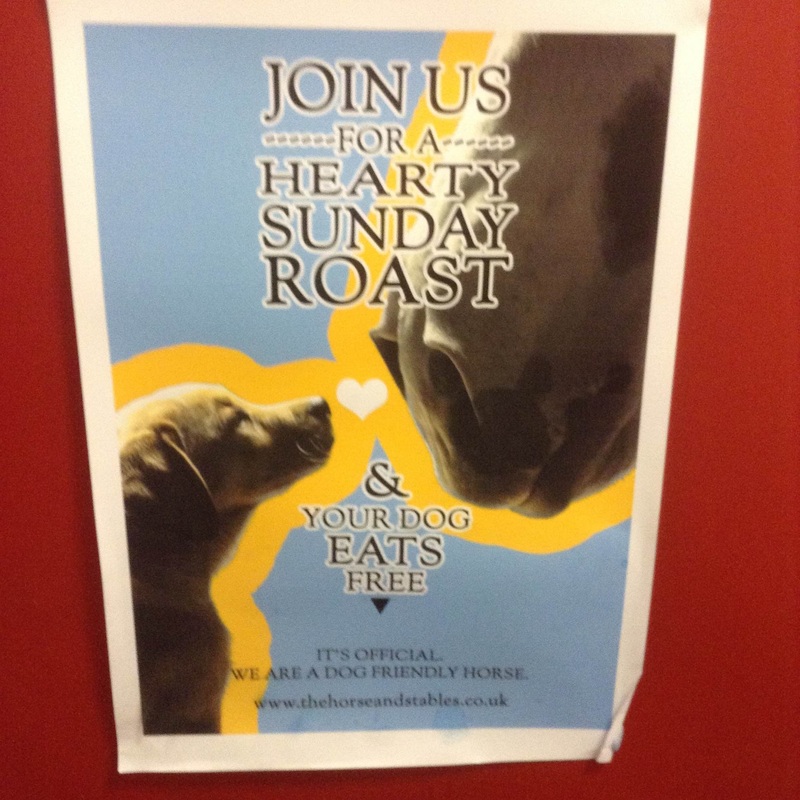 Your dog eats free… Really? Even my dog? But still, it is a cute poster. I found out later that this place is also a hostel. With a theater and comedy club upstairs. 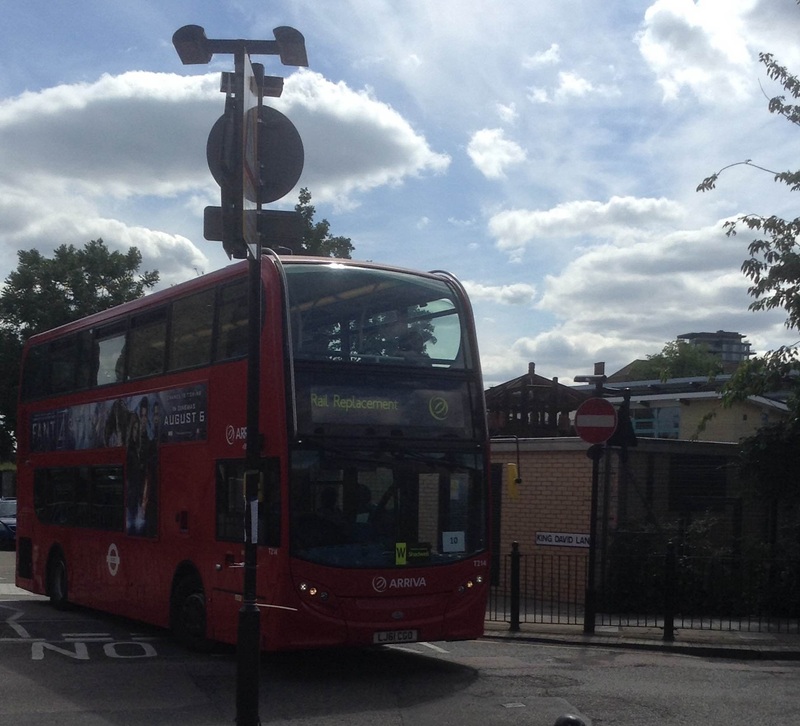 None of which I experienced however, as I took the tube back from here to Shadwell for some much needed rest. 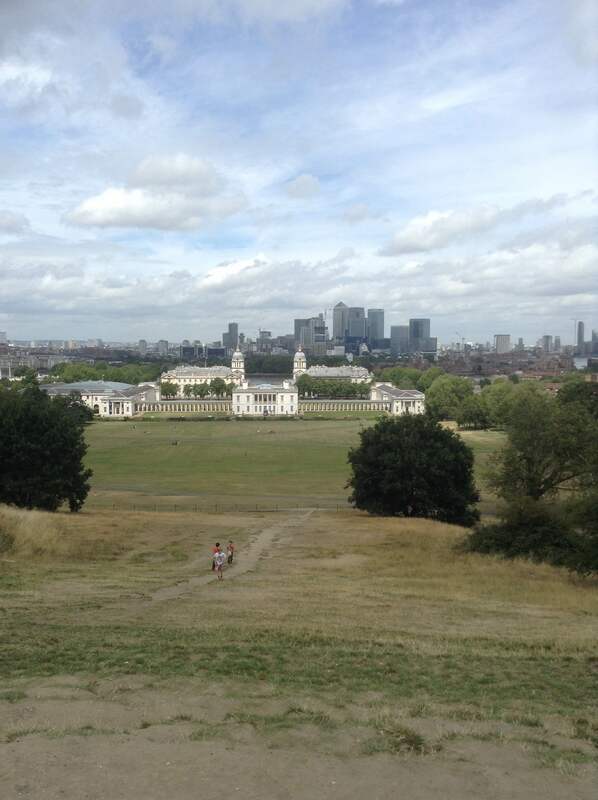 And let me say that if you have not toured Greenwich, you are really missing out on a lot. 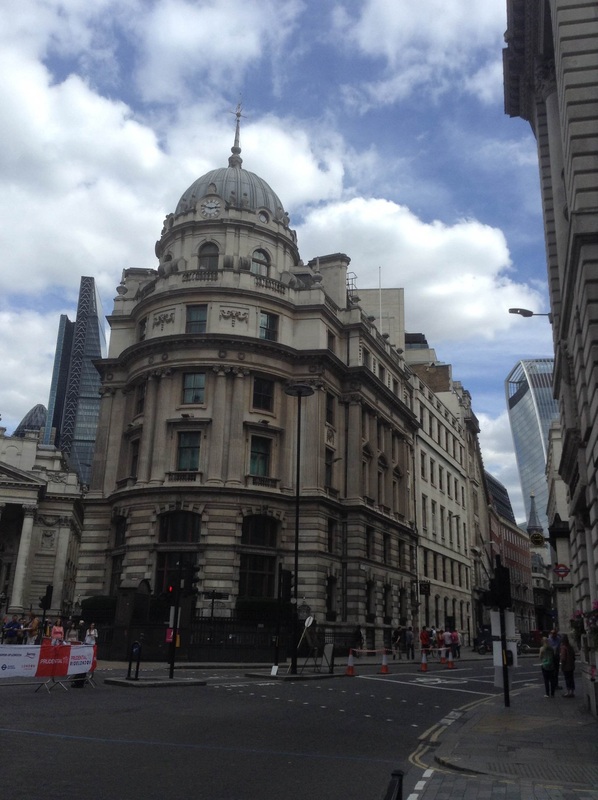 Time for Travel Hint #2, Currency exchange in England (and especially in London)… Find a UK (Royal Mail) Post Office! They exchange currency at the best rates with no commission fees. Anyways, a great visit, too short as always, but no worries! 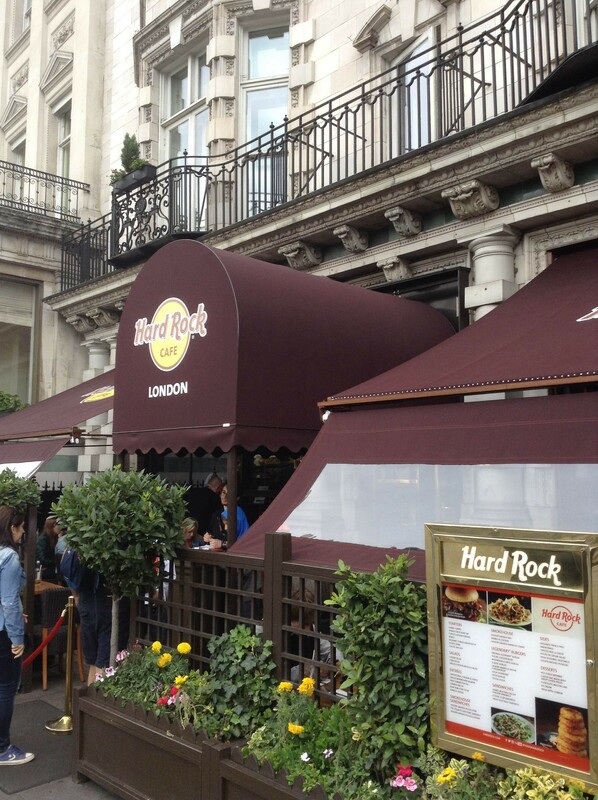 I know I will be coming back to London again. Always love reading your posts, Jeff. Really appreciate the wit. 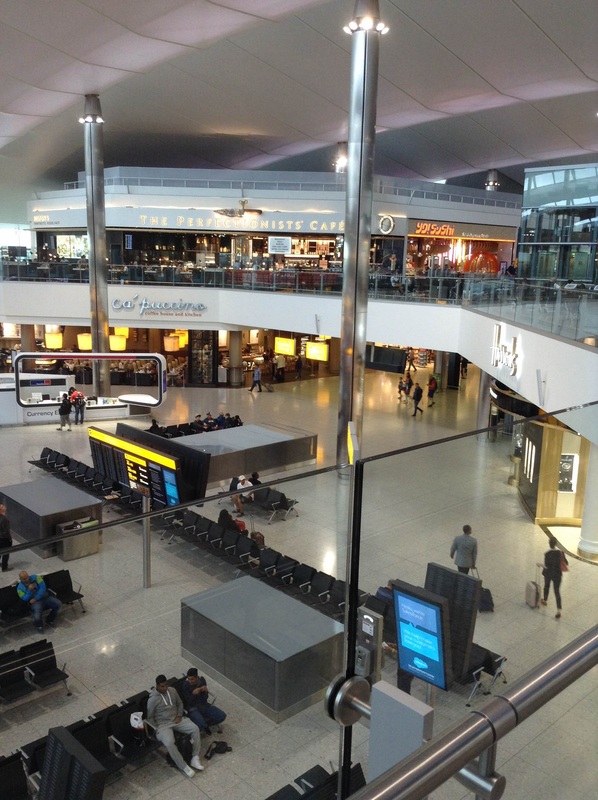 This entry was posted on November 2, 2015 by jlroehr in Passenger thoughts and tagged Big Ben, Heathrow, Hyde Park, Imperial War Museum, Kensington, London, Peter Pan, Tower Bridge, Walking London.